When it comes to lifting a 6,000 pound car off the ground, you’d really rather be safe than sorry. 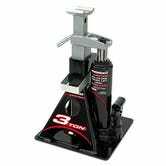 This affordable Powerbuilt bottle jack has a jack stand and a locking safety bar built in, so once it’s up, you can be sure that it stays up. $31 is an all-time low, and a great deal if you have a garage.